The East Brunswick Club has been one of Wireless Records’ favourite venues, which has been the location of numerous launches for the label, as well has being a favourite for many of its artists. Wireless Records is very proud to host a show at this venue for one last time before the venue closes. Ivy St., Slight Of Build and Radiant City have all been in a collective hibernation lately, writing material for new releases in 2012. They collectively come out of their respective caves to pay tribute to the East Brunswick Club one last time. Very special guests for the night are East Brunswick All Girls Choir and Littlestar (who have reformed as their original lineup especially for this show). 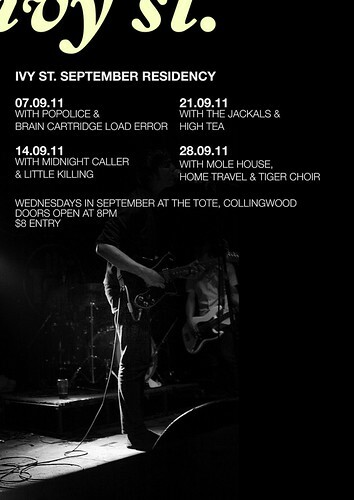 Ivy St. will play at The Tote every Wednesday during September, along with a long list of amazing Melbourne bands. For more info click here. Nightmaster are our latest darlings to join the Wireless Crew. Check them out here. You can also hear a sample track on our myspace page. Nightmaster’s debut release Tiger EP is out now digitally via iTunes or if you like to the feel of a CD, then you can get that directly from our store. Ivy St. will play the opening weekend of the Mona Foma festival in Hobart on January 23, supporting UK post punk legends Wire. For more info click here! Wireless Records now has a youtube channel. There are videos and live footage of Radiant City, Ivy St., as well as Pokett, The Dudley Corporation and Spun Rivals. Friday 19th November will see Slight Of Build launch their new EP In Your Gun at the Curtin Bandroom in Carlton, Melbourne. 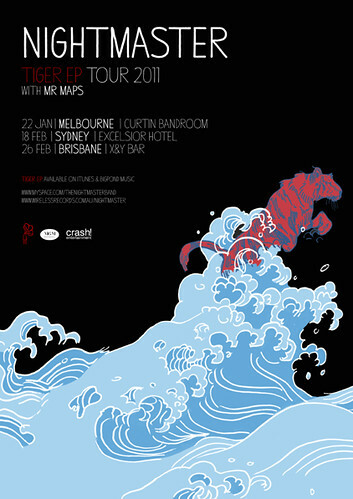 Special guests on the night are Lowtide (Ex-Three Month Sunset) and Buried Feather. $10 entry from 9pm. Check out our facebook page for all the event details. Slight Of Build‘s new EP titled In Your Gun is due for release this Friday October 8. Grab it online from our store or from any good retailer in Australia. Keep an ear out for their EP launch in November. A big thank you to Miniature Submarines and to everyone that came out to Radiant City‘s No Errors album launch on Thursday evening..
Here’s a pic taken by Fransisco Delia..
See more over at Radiant City’s blog..
Radiant City‘s long awaited debut album is almost here! No Errors will be officially released on Friday September 3. We will be putting a couple of tracks up on MySpace very soon..
Another date to write down for Melbourne folk is Radiant City’s album launch. It’s happening on Thursday 16th September at Bar Open with very special guests Miniature Submarines. It’ll be free entry so we hope you can make it on down, should be one fine eve..